Puzzles are one of our go-to rainy and snow day activities since they keeps kids’ hands busy for big chunks of time while they polish their motor and problem solving skills. This new galaxy-themed puzzle could potentially keep your family gathered around the table forever. It can be built in any direction and can be arranged in thousands of different ways and doesn’t have a fixed shape! The puzzle is mesmerizing to look at. It is printed with satellite imagery from NASA of the galactic center of the Milky Way and laser cut in Massachusetts from birch plywood. Although we understand that younger kids (as well as results-driven adults) might be frustrated by the fact that the puzzle is never “finished,” we love the idea that there isn’t a right way to start or complete it. It’s pretty enough to leave out on a coffee table or in a family room so that people can add on, remove, and rearrange the pieces at their leisure. This unique puzzle contains 133 pieces and includes an astronaut, a shuttle, and a satellite piece that can also fit into the puzzle and get imaginations flaring. Available for pre-order with shipping in early 2017. Puzzles are one of our go-to rainy and snow day activities since they keeps kids' hands busy for big chunks of time while they polish their motor and problem solving skills. 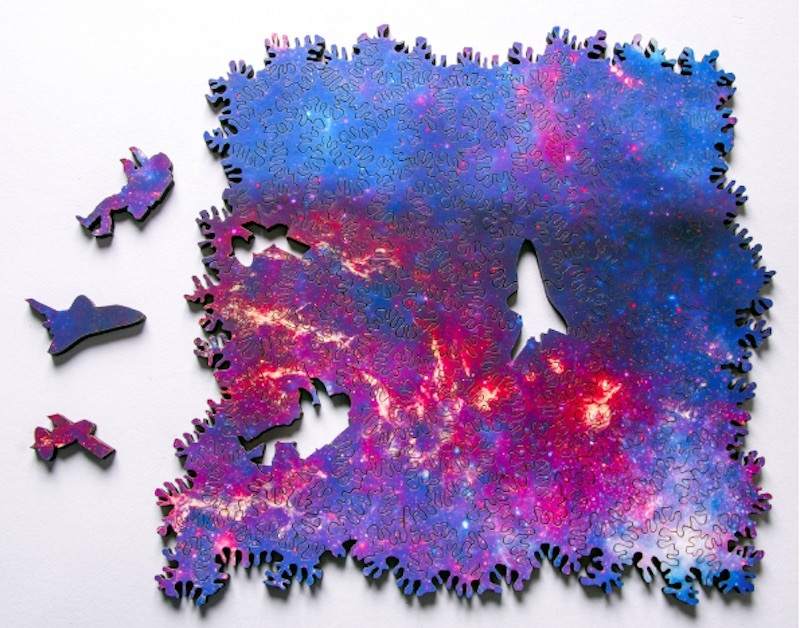 This new galaxy-themed puzzle could potentially keep your family gathered around the table forever. It can be built in any direction and can be arranged in thousands of different ways and doesn't have a fixed shape! The puzzle is mesmerizing to look at. It is printed with satellite imagery from NASA of the galactic center of the Milky Way and laser cut in Massachusetts from birch plywood. Although we understand that younger kids (as well as results-driven adults) might be frustrated by the fact that the puzzle is never "finished," we love the idea that there isn't a right way to start or complete it. It's pretty enough to leave out on a coffee table or in a family room so that people can add on, remove, and rearrange the pieces at their leisure. This unique puzzle contains 133 pieces and includes an astronaut, a shuttle, and a satellite piece that can also fit into the puzzle and get imaginations flaring. Available for pre-order with shipping in early 2017.